Oh yeah- Thanksgiving. The mother of all quintessentially American holidays… and- not coincidentally- the mother of all gluttonous holidays as well. So once you get through making all the mandatory foods, the “it wouldn’t be Thanksgiving without” foods, and anything special or new that you decided to throw in this year – you’ve got yerself a fairly serious Mount Kilimanjaro of food. 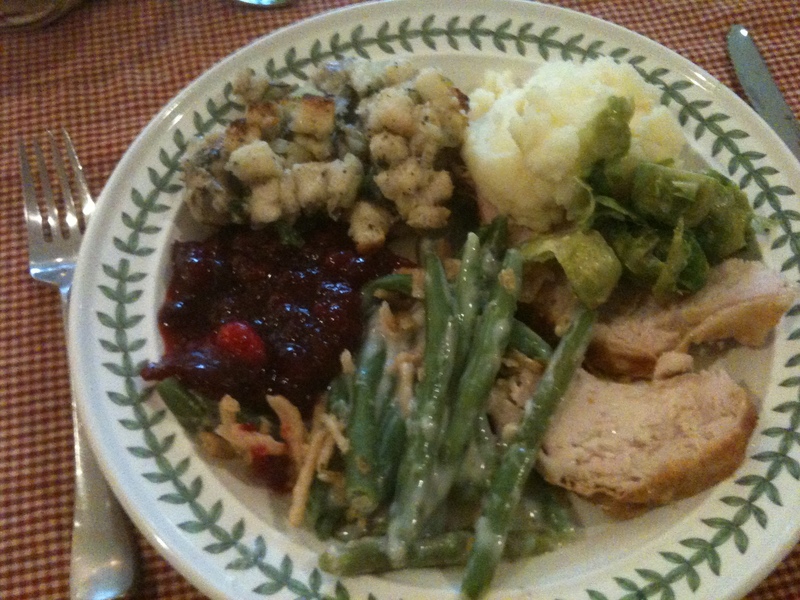 However, despite the fact that it was a ridiculous starch-fest (more stuffing with your mashed potatoes, my dear?) and the fact that many of those “traditional” dishes (marshmallows? Did the Pilgrims have those?) can practically cause instant diabetes, despite all that we got through the entire meal- with only minor modifications- No Sugar style. Gravy is always a prime suspect- but Mom bought it at Whole Foods and checked the ingredients so we were safe on that account. She also made that green bean casserole and I was amazed to find only dextrose (! ), not sugar or any icky variant thereof, in the ingredient list. Well, yay! Not that this was health food you understand, but still. It was ridiculously easy. Because everyone I know always buys those cans of jellied stuff saturated with High Fructose Corn Syrup, I’d gotten the impression it was rocket science- instead its about as easy as making oatmeal. I was very stressed about gaining the correct amount of sweetness and jelly-like texture. The problem was solved by cooking the berries in a mixture of boiling water and dextrose, and then adding a healthy dollop of one of my newest favorite things: glucose syrup. More on that in a minute. Did you know cranberries pop when you cook them? How much fun is that? Luckily, I had recently gone in search of glucose syrup- thanks once again to No Sugar guru David Gillespie- in the attempt to make one of his No Sugar recipes. Glucose Syrup? It sounded scary, like an ingredient for a science experiment involving frogs and tweezers. And it sounded even less appetizing than dextrose. Hmm. But I really wanted to make his granola bars recipe, and my attempt to do without resulted in a delicious granola bar confetti- it just didn’t hold together at all. So like dextrose, I found it online. I purchased a tiny tub of the mysterious stuff, which arrived looking more like an ingredient for my laboratory than food. It’s clear, gooey, and tar-like in consistency… it gets absolutely everywhere when you try to measure it. Yuck- this was not the kind of ingredient anyone was going to want to lick the spoon of. Then again, I reasoned, Gillespie had never steered us wrong yet. And of course, he was right: glucose syrup is the perfect solution for anything that needs not only sweetening, but also the viscous thickening that many traditional sweeteners provide: molasses, for example. More and more lately, I’ve been using dextrose powder, to the point where I actually almost forget that I’m making any modification. If the recipe says “1/2 cup sugar” I read “1/2- ¾ cup dextrose. But there are situations where dextrose alone just isn’t going to create that thick texture you need. 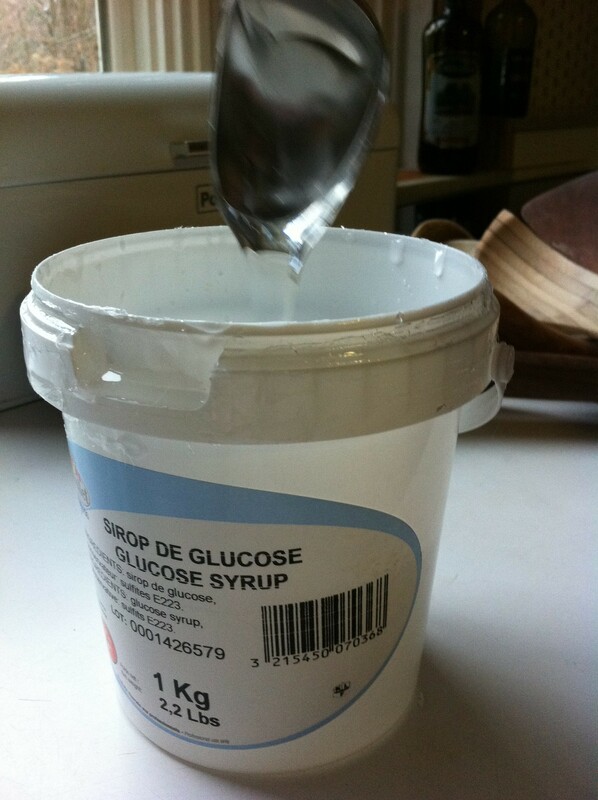 Enter: Glucose Syrup. Wearing a cape. The cranberries are saved!! One GF pie by Katrina and one regular pie by Eve! Lastly, I need to talk about the pie. Our Sugar Dessert for the month was to be our Thanksgiving pumpkin pie. But because, as I described, I’m so used to my big orange container, I completely forgot at first and used dextrose in the crust rather than actual sugar. When I got to mixing the pumpkin with the spices, I had to remind myself- go get the sugar. 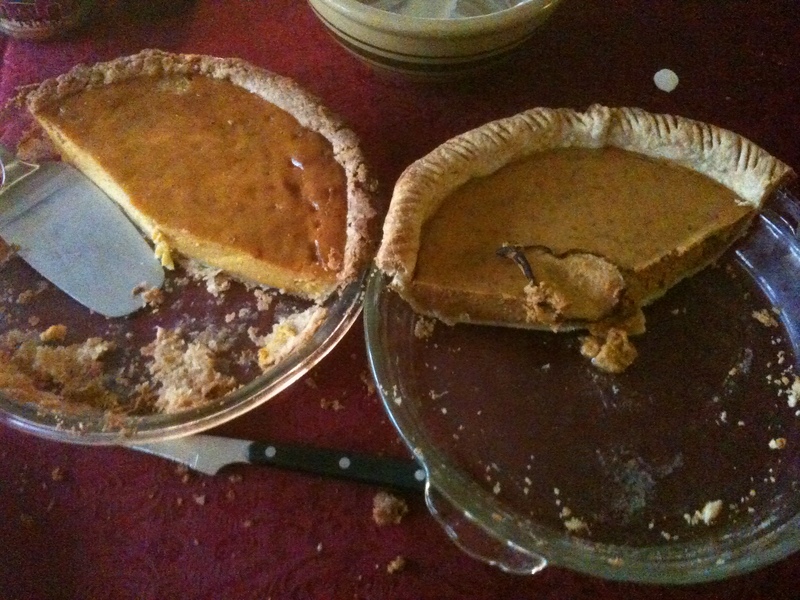 The pie was delicious, as pumpkin pie always is. It only takes ¾ cup of sugar in the entire recipe, so compared to many desserts, the swetetness is fairly mild and not likely to cause us all Banana-Cream-Pie-style headaches. Actually, our monthly dessert passed with such little fanfare that it made me wonder- have we entered a new stage here, where sugar just doesn’t matter so much any more? Can it be, after eleven months of diligence, and with the help of magical ingredients like dextrose and glucose syrup, that we can get to a place where we are conditioned to be perfectly happy with a vastly reduced level of sweet? Have we really, at last, shunned sugar? And I couldn’t help but also wonder… if I had used dextrose in the pie filling too, would anyone have noticed? Hi dear Eve, no they wouldn’t have noticed if you’d used dextrose in the pie filling. All my deserts are made with dextrose and no one notices. I do so enjoy your blogs, so amusing!!! Dextrose works great in pumpkin pie filling. I also made cranberries with only dextrose powder and it was the indetical consistency to the batch I made with real sugar. What recipe did you use for granola bars? Is that something from the book that I missed, or is that on David’s website? I want to try making granola bars. Thanks! That recipe is from David’s website, the subscription part. It is called “Fireside Flapjacks”- although I must admit that even when using the glucose syrup, I always seem to end up with delicious granola more than granola bars. Still really good. Also, David (Lizzie) use a chocolate drizzle over the top of the bars- there is debate among my family members whether it’s better with or without. I highly recommend subscribing to “how much sugar” http://www.howmuchsugar.com – there’s lots of info there, but the recipes alone are well worth it! You are currently reading A Year Of No Sugar: Post 86 at Eve O. Schaub.